Keyboards have a wide variety of voice options and style variations: 1940s Big Band trumpet. Full classical string quartet, 1920s ragtime piano. They’re all possible with a few clicks of a button! 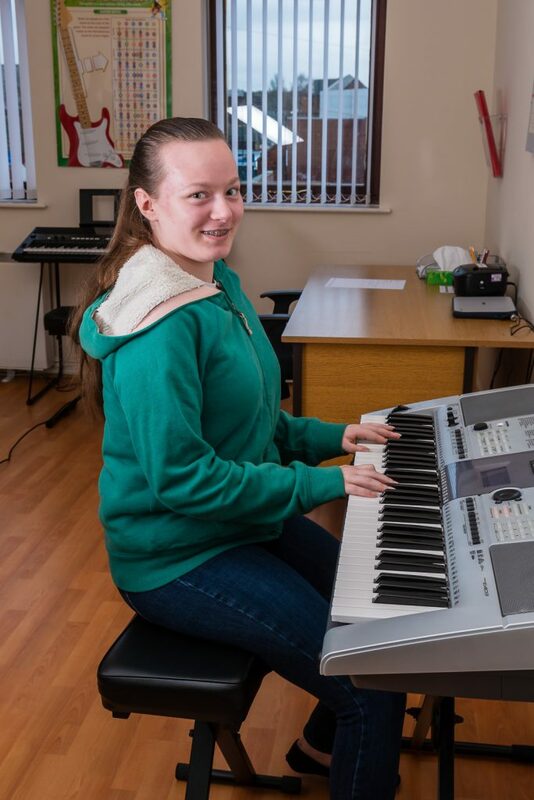 Our keyboard Students are encouraged to be as creative as possible and to make the most of the features of their instrument, making keyboard lessons extremely fun and meaning that no two versions of a song every sound the same! Keyboard Students follow the Trinity exam syllabus. And since we’re a registered Trinity exam centre, they sit their exams right here in familiar surroundings in the Sweet Symphony Studio. Our keyboard lessons are available to both children and adults. All levels of ability are welcome, from absolute beginners through to advanced players. Do I need to bring my own keyboard to lessons? No, don’t worry – our Studio is fully-equipped with several instruments per teaching room. Do I need a particular brand/model keyboard at home before taking lessons? At the beginning, anything is better than nothing. We’re not suggesting you rush out and spend £100’s on a brand-spanking new instrument, but after you’ve had a few lessons and have decided whether lessons are something you’d like to continue with long-term, you may wish to speak to your teacher who can advise and recommend a particular model for you. What’s the difference between piano and keyboard? This is a really common question. The main difference is in how you use your left hand. Piano players generally read two lines of music simultaneously (one for each hand) and can be playing different rhythms with each hand at the same time. Keyboard players usually read one line of music for their right hand, and left hand plays chords which coordinate with the rhythm and accompaniment section of the keyboard. Don’t worry if at first you’re not entirely sure which instrument it is you’re wanting to learn – at your first lesson your teacher will speak with you and find out what you want to get from your lessons, and will be able to guide you towards either piano or keyboard lessons depending on what your requirements are. How much are your keyboard lessons?